- How far can discipline and personal effort get you? - What is Grace and is it absolutely necessary for Self-Knowledge? - Is your Ego really so bad? - Must I love everyone, or just do my duty? - How can I keep love from diminishing into attachment or dissolving into anger or indifference? - Why is life so full of desire, aversion and fear? - Is there ever a need for fear? - How can I learn to use my willpower effectively to overcome my resistances? - Is there a Higher Will for my life, and if so, how can I learn to connect with it? - Is what you can “see,” even in meditation, ever the true Self? Babaji's Kriya Yoga Order of Acharyas is now offering to initiated and non-initiated students of Yoga, a course of lessons. Designed to answer such questions as these, this course will not only deepen the understanding of the principles and practices of Yoga, but will hasten the process of Yoga. In our pursuit of our Divine Self we must seek for change in our human nature. But rather than trying to change our nature, more often we merely attempt to reconcile our habits of desire, aversion and fear. So dark elements along with light continue to seek manifestation and arise in the context of our life. The Grace Course provokes us to delve into our desires, aversions and fears in order to reveal to us our truth and falseness. By learning the source of our repetitive thoughts, endless desires and stifling aversions and fears, we become aware of how the demands of the ego influence us negatively at all moments in any situation. Instead of protecting us, the ego, which is really quite fearful, is keeping us blocked from our true nature, our true potential and our true work in the world. As ingrained habits and instincts are probed, weaknesses are amplified. This process is personal and profound and real work. The primal strength of the ego’s desire to exist is too strong to overcome without the support of Grace. Grace is the only means by which vital motivations of the ego can be replaced by higher consciousness from the Soul. Grace is a force of nature like the elements and like the elements is always present, whether we acknowledge it or not. Grace is always available to anyone who remains open to it. We must internally prepare to remain open to Grace. This course is designed to widen your perspective of what your yogic practice truly must become, a process of bringing awareness into your thoughts, your actions and into your life. It introduces the right use of will, which can direct the practice of Yoga to benefit you personally, but in addition, can connect you with a Higher Will, which works to widen you, so as to benefit your family, friends and the world at large. The practices included will incorporate the teachings of Babaji's Kriya Yoga-Action with Awareness- into your daily life. 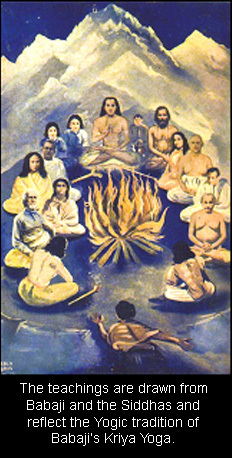 These teachings are drawn from the works of Babaji and the Siddhas, Sri Aurobindo and the Mother. 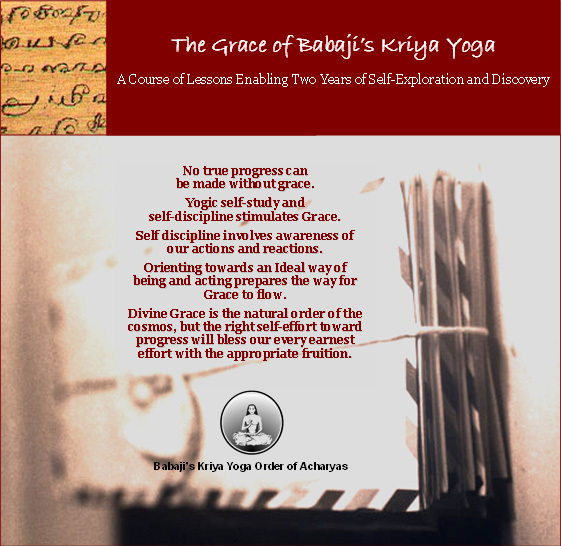 The total of these teachings reflect the Yogic tradition of Babaji's Kriya Yoga. If sincerely and genuinely approached, this course of lessons will affect change at various levels of your consciousness, as your awareness and love grows. - Fear: Is it Safe to live without it? - The Infinite Aum: Personal or Impersonal?